Quality service at prices that represent genuine value. Pick-up and delivery of your oriental and specialty area rugs, which will be cleaned at our location. Odor Control for Pets, Smoke, Cooking, etc. Furniture will be carefully moved and replaced on special protectors, preventing rust or furniture stains. 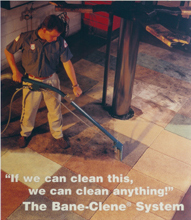 When necessary, a heavy-duty commercial vacuum will be used to remove dry, abrasive, fiber-damaging soils. Carpets and upholstery will be treated prior to extraction with special cleaning agents which break down and suspend difficult soil. Suspended soils will be quickly flushed out of your carpet and your home by our warm-water extraction process. Carpets will be left clean, bright, and without damage or soil-attracting residue. Special spotting agents will be used to remove any difficult or persistent spots. When moving your heavy furniture, dust will be wiped clean from the exposed baseboards. The pile of your carpet will be carefully set for maximum appearance, softness, and rapid drying time. Your carpet will be left with a beautiful, finished appearance. Copyright 2013 McHugh's Professional Carpet & Upholstery Cleaning. All rights reserved.